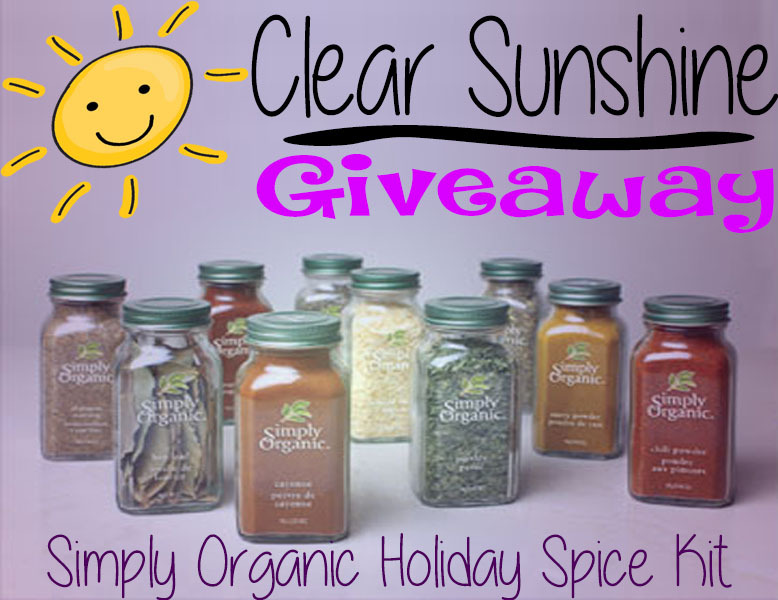 Today we are giving away the Simply Organic Spices that include: ginger, nutmeg, allspice, and ground cloves. This contest is valued at $30 and runs from Oct. 31st – Nov. 14th. Just in time for the holidays! Use the Rafflecopter widget below to enter to win. Come back and enter multiple times by Tweeting about us and telling your friends! I’d use them with lots of pumpkin-Pumpkin Casserole, Pie, Bread, and Pumpkin Butter. Mmmh, I would make a coffee cake. I’d make a huge amount of gingerbread men (and women) cookies – and then invite friends to decorate them! Once we then hung them as ornaments for the Christmas tree – fun! and they were still edible later, to dunk in milk! I am going to make pumpkin pie and pumpkin bread! I would definitely make pumpkin pie! Treats and savory dishes of all kinds! Clove and ginger are great in stews. I would make so many things. I would start making a wonderful organic chili! Chili is one of my favorites during the colder days of fall/winter. I like to try new recipes all the time. I would use these to make dinners with such as chicken. These spices were must have on hand favorites of my mothers. She used some of these in her Sweet Potato pie. I might give that a whirl! Thank you for the giveaway! I’d start with spice cakes and mulled cider. I would use them to make pumpkin pie for Thanksgiving. I would make some Pumpkin Banana Muffins or Bread. I would love to make a hearty bowl of chili. I can think of all sorts of quick breads, frostings, pumpkin pie, puddings, custards and cookies. I would make my grandmother’s sweet potato pie! I would make Pumpkin Cupcakes! Yum! I would want to find a new crock pot recipe to use with these, or maybe bake some muffins. I would cook some pumpkin bread. I would use the spices to make vegetable dishes or soups for the winter. I would make some homemade spaghetti sauce with meatballs. Love using organic spices to spice up my cooking! i use herbs and spices in all my meals! i have a few from the brand and really like them. thanks for the chance! A pumpkin pie would be first on my list! I would make holiday cookies! I would use these spices in my morning smoothies! I would use them for holiday cookies and in soups. I would love to make Apple pie and Pumpkin bars! I love these spices! The first thing I would make would be a Pumpkin Pie. Our local vol fire department has a charity rib cookoff,so I would give this to them.thanks so much. I would make pumpkin pie and Chicken soup with the spices. I would make some pies for Thanksgiving. The Ginger and Allspice would definitely be use in a lot of different Asian dishes. The Nutmeg would be grand for many cream based sauces and soups with veggie – pastas too. I also love nutmeg in tapioca and RICE puddings! Cloves would be good with Ham and aromatic teas and room freshners. I would also consider donating them to a soup kitchen that my husband and I volunteer at weekly. I would use them for thanksgiving dinner and on Christmas sweets. I’ll make some yummy cookies with these. I’d use them for my thanksgiving cooking! I would make a pumpkin pie! I would use the nutmeg in my butternut squash soup and the ginger in my holiday ginger cookies.